One of the drawbacks of not having a big publishing house behind you is that you have to do your own author photos and cover designs. Mary T. Wagner shares how her cover shoot elevated the “do-it-yourself” experience to the realm of high comedy. There are a lot of up sides to being what I call a “DIY” author, one of the zillions of writers out there lately who have decided to pass on reaching for the brass ring of a traditional publisher and just gone ahead and pushed “print” ourselves. The folks at Amazon have made it so easy!!! As I figured out when I chose that route for my first book several years ago, “Running with Stilettos,” it meant that I could actually see my words in print about a year and a half earlier. As for the other intangibles, I wrote a long essay on that very subject, and the highlight reel includes a feather boa, bagpipes, and tropical drinks in an Adirondack chair under an ocean breeze. HOWEVER…one of the drawbacks of not having a big (or even a small) publishing house behind you is that you don’t have…minions, for want of a better word…arranging such things for you as proof reading and author photos and cover designs. This shortage of minions was challenging enough recently when I took it upon myself to shoot a few “author selfies” in my backyard. With my new book “When the Shoe Fits…Essays of Love, Life and Second Chances” set to debut on Amazon around August 1, it seemed like a good time to get a headshot that wasn’t cropped from a vacation photo. Using my digital camera, a tripod, actual eye shadow and a good drenching with bug repellant. I managed to finally get several usable shots over three separate evenings. The best shot came on the night that my eighty-pound dog Lucky nearly knocked me over chasing a gopher that streaked past my ankles in a blur of brown. At moments like that, mindful that Lucky once gave me whiplash while crashing into me from behind, I just let my knees go limp, surrender to fate and hope for the best. But it was the cover shoot a few months earlier that elevated the “do-it-yourself” experience to the realm of high comedy. All of my earlier books—“Running with Stilettos,” “Heck on Heels,” and “Fabulous in Flats”—had two things in common. 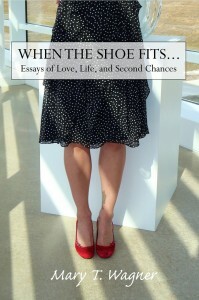 They were all collections of my slice-of-life web essays, and they all featured my shoes on the covers. Spike heels on the beach, spike heels by a volcano, flats on…okay so I photo-shopped the flats into a moonlit beach stock photo. I had rounded up my favorite and reader favorite essays from all three books into a “best of” collection for the new book, and figured it was time to finally start looking through professional photo services for an image I liked for the cover. After days of searching, I finally found a photo that I thought worked perfectly—a woman with great legs in cute flats and a floral skirt shot from the waist down, surrounded by an assortment of other shoes. It was bright! It was colorful! It cost four hundred and fifty dollars!! OMG. Have I mentioned that I’m frugal by nature and necessity? That was about $400 more than I’d planned to spend. I summoned my dozing entrepreneurial spirit once more and started searching my closets for shoes and a skirt. Shoes, I have by the dozens. (Go figure). The skirt was more problematic. I didn’t have anything as dramatically and flamboyantly colorful as the one in the expensive photo, but polka dots can spice up a scene, and I have three polka dot dresses. I reached out to a friend who owned an Italian restaurant with gorgeous, sponge painted walls the colors of sun-drenched Tuscany, and set up a time to bring over my camera and the shoes. Then I also won the good graces of a new and local art museum noted for its stunningly spare and airy white design. And then I got to work. Set up my itty bitty camera on the tripod in my bedroom, and shot various shoe combos against the wall as a test run. Then I tried on the polka dot dresses. With apologies to Goldilocks and the Three Bears, the first dress was too long (and the polka dots were too small!). The second dress was too…fluffy. The third dress was just right…except that I couldn’t zip it shut. I’d bought the dress in a spirit of optimism a couple of years earlier, while searching for a dress to wear to my son’s wedding. I’d found the perfect dress for the occasion, but while I was looking I also fell in love with this one, all layered chiffon with a deep V-neck. The only dress left on the rack was in a size 2 (I am most decidedly NOT a size 2), and so I searched for it on line, and ordered a size I guessed would fit. When it arrived, I found I’d guessed wrong…but hey, my diet plan for the wedding was working and I’d surely end up in the dress eventually! The best laid plans… Two years later I’d packed most of the the pounds back on and the dress still hung in the closet, unworn and forlorn. Still…working with a 10-second timer on the camera and holding the dress together with my hands, I reasoned, this dress could work for the cover. An audience might die laughing, though. The day of the photo shoot arrived. In a stroke of good fortune, my circus aerialist/performance artist daughter had just flown in late the night before from an art gallery opening in California. When the museum called to reschedule our shooting time from morning to later in the afternoon, I sensed an opportunity. I had, on occasion, been Sarah’s unofficial photographer for some of her art projects—our last adventure involved her dangling in pearls and a dark blue sweater from a tree branch in a cemetery—and she had often offered to repay the favor. And her legs were better than mine. And after spending a few in California, she even had a bit of a tan! When the artist awoke, I loaded two cameras and the tripod, my basket of shoes and boots into the car, and drove over to my ex-husband’s house to pick her up, stopping at the grocery store for a few long-stemmed roses. Still groggy, my daughter asked “do I have time to shave my legs?” Nope. While she finished up writing an article on deadline about someone in Finland that she had interviewed recently, I stepped out to the porch and watched squirrels cavort in the sunlight. Then my ex’s wife (who is also my daughter-in-law’s mom) cheerfully pitched in a pair of her bright red patent leather stilettos to add to the assortment, and Sarah grabbed a perky pair of black gladiator sandals belonging to the ex’s wife’s daughter, and we were off! We trundled into the museum lugging the cameras, the basket of shoes, my tall riding boots and a set of snow shoes, and found a bend in a stairwell where beams of light from a wall of glass splayed across the floor. And then we got busy, taking care not to crash into a glass sculpture on a pedestal just a few feet away. The museum’s development director hung out with us as we worked. I think she was probably keeping a closer eye on the glass sculpture than on us! I had a particular vision for the cover, which basically mimicked the professional photo that I was too cheap to buy. And so we swapped shoes and boots in and out of the scene, shooting with and without flash, juxtaposing work boots and leopard-print sling backs and the riding boots standing with the roses in them like a vase. Sarah dutifully jumped in and out of the shots as required, occasionally rooting through the basket of shoes for another pair and posing in sandals and flats and spike heels, gloriously clad in my polka-dotted dress making its maiden voyage. At some point, as I dug to the bottom of the shoe pile, Sarah strolled a few feet out of the frame, and I sensed a quixotic opportunity. “Hold that pose a second, honey!” I said, and I snapped three photos of just her alone. And then we got back into harness, lining up the shoes and boots against the wall and shooting away. Then we bundled up all our gear and did it all over again at my friend’s Italian restaurant, posing shoes and daughter and polka-dotted chiffon against those beautiful sponge-painted walls. But life—and art—rarely go according to plan! Of all those dozens of photos that we shot at restaurant…I took them out of the running when the restaurant changed hands just a few weeks later, taking us all by surprise. And of the dozens of photos that we shot at the Museum of Wisconsin Art…you guessed it, the perfect one turned out to be one of the three “just for fun” pictures I took in between the “real” work. Ha ha ha!! As for the dress…well I still don’t quite fit into it yet! But I’m making slow progress in that direction. And when I look at the new book cover, I can almost imagine that it’s me standing there! 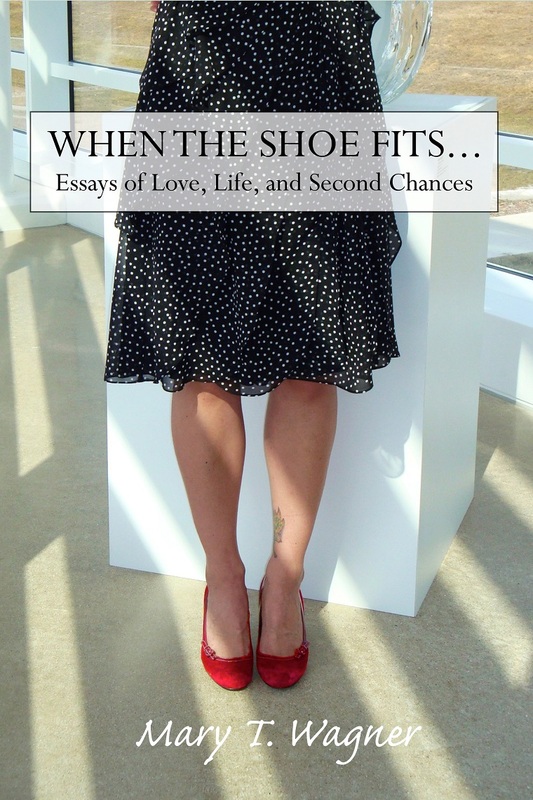 When the Shoe Fits…Essays of Love, Life, and Second Chances is now LIVE in the Amazon store, with some lovely reviews and a Discussion Guide for book clubs in the back of the book. When a hard fall from a tall horse landed Wagner—then a freelance writer and a soccer mom with four young children—in a body cast for three months, she didn’t take it as a sign to ease back on the throttle. Instead, she changed careers, went to law school, took a job as a criminal prosecutor, and bought her first pair of spike heels. And THEN she started writing again. Wagner’s first three collections of her slice-of-life essays—“Running with Stilettos,” “Heck on Heels” and “Fabulous in Flats”—earned numerous national and regional awards, including an Indie Excellence Award and a silver IPPY. Both “Heck on Heels” and “Fabulous in Flats” were finalists in ForeWord Review’s BOTY Awards. Her legal experience has been similarly eclectic, ranging from handling speeding tickets to arguing cases before the Wisconsin Supreme Court…sometimes in the same week! Award-winning Wisconsin author and photographer Mary T. Wagner has been described as “the Midwest’s answer to Carrie Bradshaw” and favorably compared to humorist Erma Bombeck…but “in sexier shoes.” A native of Chicago, Wagner is a former newspaper and magazine journalist who changed careers at forty by going to law school and becoming a criminal prosecutor. 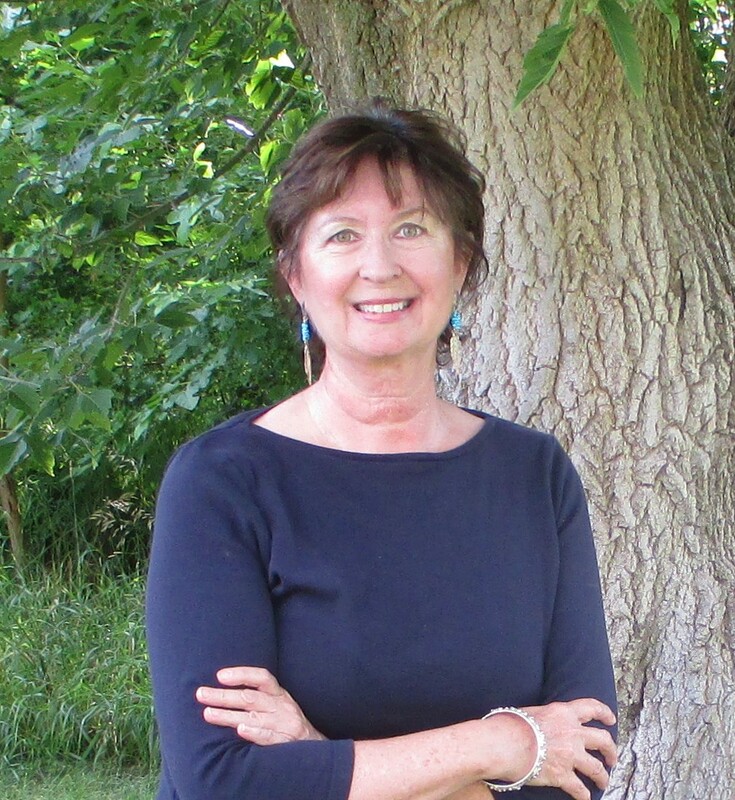 A mother of four, she lives in rural Wisconsin, where she draws much inspiration for writing from daily walks in the countryside with her dog, Lucky, and the cat who thinks he’s a dog…Meatball. 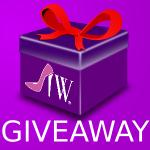 You can Like Mary on Facebook, Follow her on Twitter, and check out her website at www.marytwagner.com. Here is the other shot Mary took of her daughter when they were just killing a few minutes between the “real” photo shoot. I am too cheap to pay for professional portraits, too. I love that you decided to do it yourself and ended up getting a great picture. Interesting. I do think if you know what to look for using non-professional photos for cover work can work out. I wonder if the tattoo affects people’s perception of the book. I’m loving that story about her dog streaking past after a gopher and it turning out to be her best shot. Sometimes the best things in life are unexpected. Loving her story. I love taking my own pictures, I have a really great canon photo. I’m glad everything worked out in the end for you. I really enjoyed your journey on the covershoot, I have done similar photographic shenanigans as well instead of paying for a very expensive photographer. DIY saves you a lot of money. I think I would rather do it DIY. Love this! No reason to pay that kind of money when you did such a great job yourself! Looking forward to reading the book! These are adorable shoes! Also I love that you shared this with all of us and potentially we can all take some advice from this and grow our own publishing expertise as a result. Thanks! Your pics are really good – I am looking forward to reading your book. I too live in Wisconsin. I noticed it is only Kindle version right now – I have a Nook. I am sure I will be able to get the Nook version soon. After all the hard work, time and stress.. it came out perfectly and very professional. Well this is fantastic! I have so many kids and half of them never want to sit for photos or cooperate in ANY way so I do my own! This is great! LOL about your dog and that gopher!! Glad you got some good shots though, they really look great! Love your cover photo, and your headshots turned out cute, too. I recently had new head shots done for my site. I would love to do them myself, sometime. We do alot of DIY around this house especially photos and most recently we did our own family photos. Its expensive to pay someone to take pictures. Glad you were able to do DIY and got a great shot. I think your photos look great. I have a dslr that I have yet to really make use of the time and remote. I should because I could use some photos for my websites! I love taking my own photos, getting professional ones cost way to much an i always want them all. Taking them myself gives me more options and saves me tons of money. I think your pictures came out perfect, awesome job and GREAT story. I would have been too cheap to spend $450, too. I like the way the “just for fun” photo turned out, though. I would have never guessed it wasn’t fully intentional. I think the cover came out great! It would have been expensive to get it done professionally and might not have turned out this good! I love taking my own pictures. I’m not personally in them so my next investment is definitely a strong tripod that will hold my camera safety. That’s a great photo! It’s interesting to hear the background and I’m sure I’ll look at cover photos now and wonder how they were taken. I would have never known it was not professionally done. I am too frugal to pay for many things so I completely get the wanting to do it yourself. It can be hard to justify the cost of professional photos, however, as a budding photographer… I know they are important! I try to keep costs reasonable to reach everyone. Professional photographers are great… if you have LOTS of disposable income. If you don’t… well, I just whip out the camera, make sure the lighting’s good, and do it myself. I think it turned our fantastic. Love that dress to by the way! I have to admit that my eyes were immediately drawn to the red shoes. There’s a museum by me that I too love to take advantage of the empty spaces and take photo’s. It’s just something about the natural light. Great choice. The photos turned out great. I feel like things always go wrong when I’m trying to snap just the right photo too. If only readers knew how much work goes into creating blog post photos. All you pictures turned out great. I recently wanted to take a professional looking head shot and found myself struggling to do. May be I will try again. Speaking of the 10 second timer on a camera. I lost my remote for mine, so when I use it, I have to set it… run and get myself ready for the flash of the camera. I run back and forth so many times I lose count. There’s a REMOTE for these things? LOL! Your cover photo is great. I hate getting my photo taken but I have a couple friends that take fantastic photos for me. I think this is great photo, love how professional it looks for DIY. Perfect! I am too cheap to pay for professional photos. I think what you did is great. I had to laugh over your dog story. It sounds a bit like my life with to crazy dogs always under foot. I think you did a great job on your headshots! I need to get one of those timers! I WISH I could figure out how to set the timer for more than ten seconds! Jumping from the camera into the shot and trying not to trip over something (tree root, dog, cat, gopher) can be pretty exhilarating. My husband has written his first book and published it on Amazon. it’s so great that writers have that outlet. The pictures look great! I am so glad that the cover came out well! It cracks me up all that you went through for a few simple pictures! Your photos look great. It all turned out really well! I hate having my picture taken, even when it’s for official/corporate purposes. I feel like they’re too staged and I don’t look like myself. I love the DIY shots -they turned out lovely. Love the story behind the cover of your book. Too often, people use stock photos that cost a few dollars and don’t really put anything into the photo. It’s amazing what you did with a skirt and shoes from your own closet! Thanks for the kind words! I would LOVE to post a photo of the other spur-of-the-moment shot that I took, but I can’t figure out how to attach it here! Send it to me and I can add it to the post. That is the only way we can add pictures. That is actually awesome – who says you can’t do it yourself, right? Lovely cover! 99% of the time I take our own pictures. The only 2 times recently that I didn’t was because I was using a photographer for review.